Tip: To avoid scratching or damaging the cylinder walls when removing or installing piston and rod assemblies, cut two short lengths of 3/8” hose and slide it over the rod bolts. Rebuilding an engine takes time, patience, attention to detail, and plenty of room. The first thing you need to do is clear out some space in the garage, enabling you to work in an efficient and orderly manner. At this point in the game, organization is everything. There are too man small parts to label and keep track of to work in a messy shop. First off, the motor needs to be thoroughly degreased and mounted on a sturdy, rotation-style engine stand. This will allow for easy access to the lower rotating assembly. Before flipping it over however, the intake manifold and the cylinder heads should be removed from the top of the motor. Remember to drain the engine oil prior to disassembly. Slowly turn the engine block over so the oil pan is facing upwards. Remove the retaining bolts and the pan, and label the hardware. In addition to the pan, disengage the oil pump and extension shaft, and set them aside for added clearance. You now have a clear shot at the connecting rods and their caps. 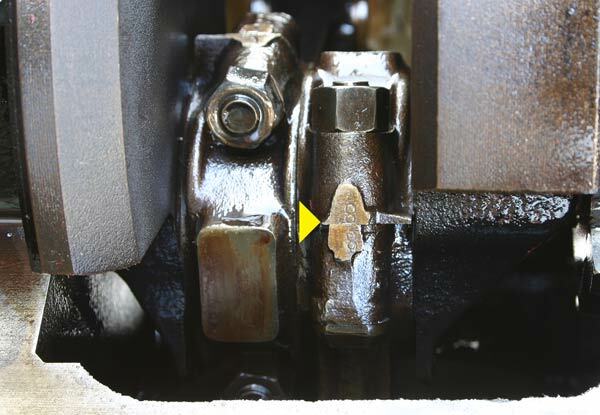 The rods are attached to the crankshaft by two bolts and a cap. Grooved inside both the connecting rod and the cap is a precisely machined bearing. The bearing rides directly on the surface of the crank- reducing friction and minimizing wear. 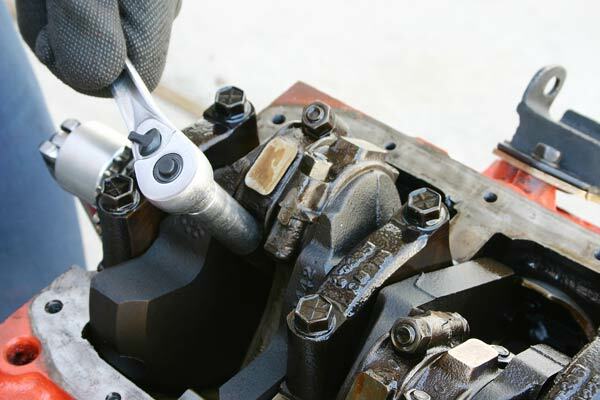 With the oil pan removed, loosen the connecting rod caps from the crankshaft. Before removing any components from the rotating assembly, you first need to stamp and label the parts in relation to each other. This will simplify the installation process and guarantee proper fit. Mark the connecting rod cap for each cylinder to its respective rod with a scribe. Each cap must be reinstalled on the correct rod in the correct direction. At this point, loosen and remove the rod bearing cap and the rod bearing. The connecting rod and its cap is stamped with their proper cylinder designation. Once the nuts are removed, the rod bearing caps can be pulled off the crankshaft journal. The bearing shell slips right into the recess of the cap. With the caps and bearings removed, the rods and pistons may now slide out of the cylinder bores. Coat the cylinder walls with clean engine oil to protect the inner surfaces and ease the pistons out. It may be necessary to lightly tap the ends of the rods with a mallet to initiate the process. Once the rod and piston assembly is removed from the block, reconnect the proper cap and nuts. Again, label the rod and the piston in relation to its designated bore in the engine block. With a little tap below from the mallet, the piston and rod assembly should slide straight out. Now it’s time to replace the rod bearings. 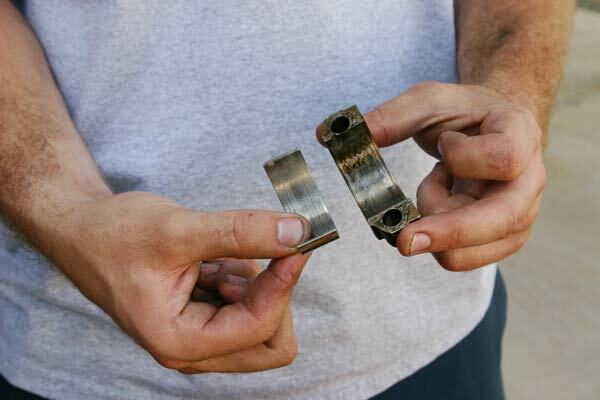 The connecting rod bearings consist of two halves or shells that are interchangeable in both the rod and the cap. With the bearings in position, the ends will extend slightly beyond the rod and cap surfaces to ensure proper seating when tightened down. It’s important to closely inspect the bearings once the rods and caps have been removed. Any flaking or scoring in the surface indicates excessive wear, as they should definitely be replaced. Be sure to check for proper clearance on the crank journal as well. If the crank shows any signs of ridging or damage, the crank must either be replaced or reground and fitted with undersize bearings. 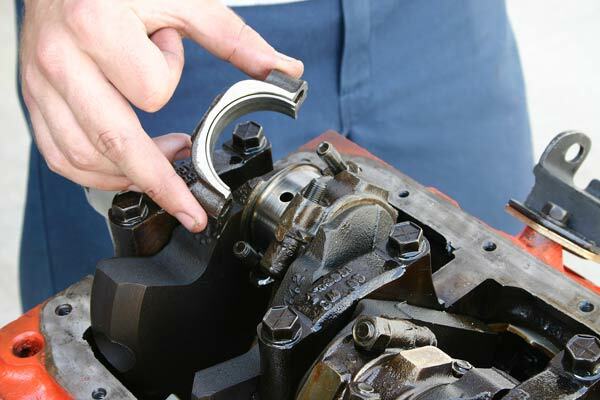 The best way to check for the correct rod-to-crankshaft bearing clearance is to use Plastigage. After cleaning the bearing shell and the crank journal, place a piece of the gauging material lengthwise along the bottom center of the lower bearing shell. Install the cap with the shell and torque the nuts to spec. Be careful not to turn the crank while the material is in the bearing. Upon removing the cap, the material will be flattened and stuck to either surface. Using the scale provided with the product, measure the material at its widest point (in thousandths of an inch). Check the manufacturer’s specifications for the desired clearance for your motor. Keep in mind you may need to purchase undersize bearings in order to achieve the specified gap. When this is accomplished, re-clean the journals and install the new bearings. 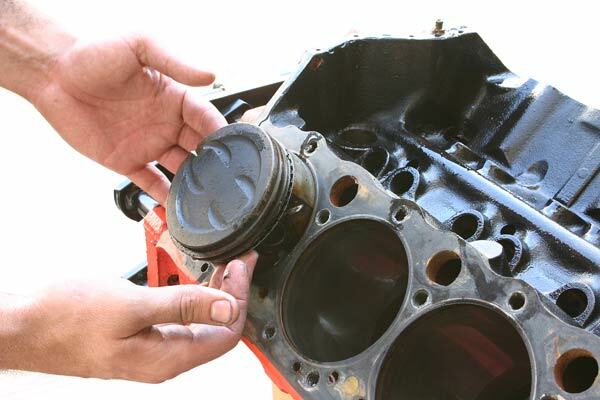 Be sure to coat the bearings, the cylinder walls, and the crank journals with clean engine oil prior to reinstallation. One at a time, insert the rod and piston assembly back into its designated cylinder bore in the engine block. The direction of the piston, the rod, and the cap should be identical to the breakdown. The notch in the top surface of each piston should be facing the front of the motor when installed. The rod bearing caps should remain loosely fitted on the crank journal until all piston and rod assemblies have been installed. Finally, check the clearance between the sides of the rods and the crankshaft using a feeler gauge. Make sure everything is within factory recommended spec. Proceed to reinstall the oil pump and pan. There are plenty of useful videos on replacing rod bearings and connecting rods on youtube.com This article, combined with some actual video may help you with your project. Good luck!